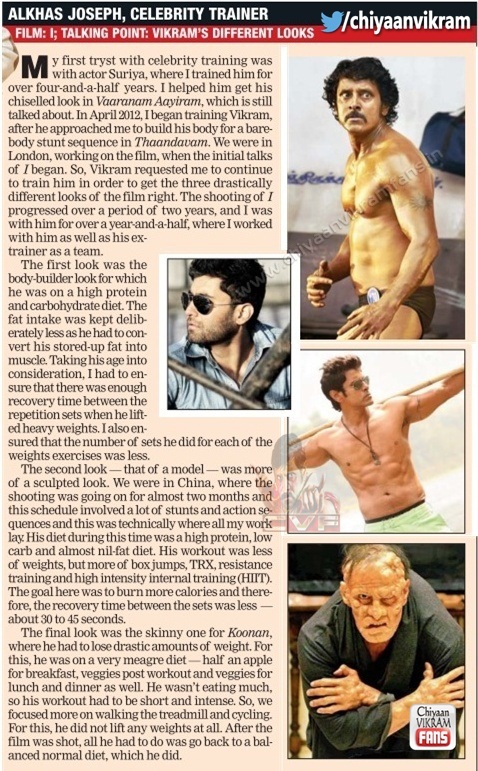 My first tryst with celebrity training was with actor Suriya, where I trained him for over four-and-a-half years. I helped him get his chiselled look in Vaaranam Aayiram, which is still talked about. In April 2012, I began training Vikram, after he approached me to build his body for a barebody stunt sequence in Thaandavam. We were in London, working on the film, when the initial talks of I began. So, Vikram requested me to continue to train him in order to get the three drastically different looks of the film right. The shooting of I progressed over a period of two years, and I was with him for over a year-and-a-half, where I worked with him as well as his extrainer as a team. The first look was the body-builder look for which he was on a high protein and carbohydrate diet. The fat intake was kept deliberately less as he had to convert his stored-up fat into muscle. Taking his age into consideration, I had to ensure that there was enough recovery time between the repetition sets when he lifted heavy weights. I also ensured that the number of sets he did for each of the weights exercises was less. The second look -that of a model -was more of a sculpted look. We were in China, where the shooting was going on for almost two months and this schedule involved a lot of stunts and action sequences and this was technically where all my work lay. His diet during this time was a high protein, low carb and almost nil-fat diet. His workout was less of weights, but more of box jumps, TRX, resistance training and high intensity internal training (HIIT).The goal here was to burn more calories and therefore, the recovery time between the sets was less -about 30 to 45 seconds. The final look was the skinny one for Koonan, where he had to lose drastic amounts of weight. For this, he was on a very meagre diet -half an apple for breakfast, veggies post workout and veggies for lunch and dinner as well. He wasn't eating much, so his workout had to be short and intense. So, we focused more on walking the treadmill and cycling.For this, he did not lift any weights at all. After the film was shot, all he had to do was go back to a balanced normal diet, which he did.